i discovered this amazing ready-to-eat (and shelf stable) food from Tasty Bite. in my grocery store, the indian section is directly across from all of the pastas. loving indian food, i decided to give one of these bad boys a whirl. 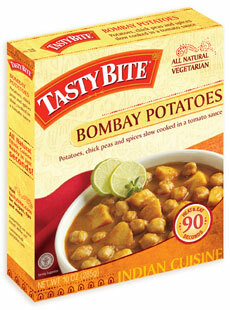 i picked up bombay potatoes and let me tell you this thing is DELISH. and not bad for you, either! vegetarian, vegan, gluten free, all natural. what could be wrong with that? bombay potatoes is “potatoes, chick peas and spices slow cooked in a tomato sauce.” it had an amazing flavor and just enough kick. i brought it in for lunch and ate the whole thing (2 servings). it would have been more amazing if i brought rice to eat along with it. this would go great with chicken for a really quick meal. i will definitely be trying out more of these ready-to-eat sides from Tasty Bite soon. what a great way to shake up your meals. This is one of my favorite breakfast foods. I got this from Hungry Girl. So delicious. Prepare the broccoli and cheese sauce according to the directions and put aside. Heat a non-stick pan with nonstick spray to medium heat. Add the egg substitute until cooked. Put aside in a bowl. Re-spray pan and add potatoes cooking until just golden brown and thawed. I add a little salt here. 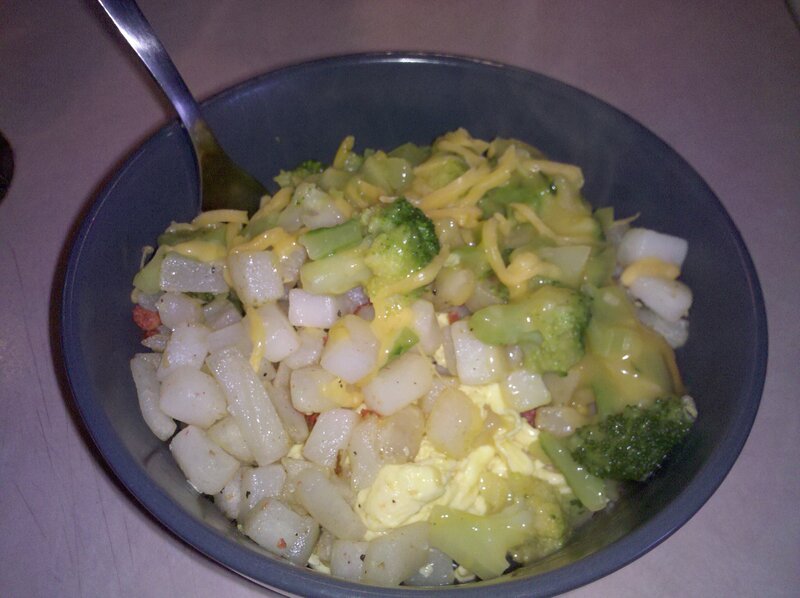 Add the potato mixture and broccoli and cheese sauce to the eggs and mix. Add the cheese and microwave for about 30 seconds or until just melted. Enjoy! You get a huge portion (this is one serving!) and it is quite delicious.